There’s nothing more satisfying than a large bowl of hearty winter soup on a chilly day. Recently I made a large batch of Winter Minestrone Soup and Matt and I both agreed it was one of the best soups we’ve ever had. It does require a little bit of prep work, but it’s totally worth it! pasta according to the directions on the package, drain, and set aside. Parmesan cheese and a drizzle of olive oil. oooh…looks awesome – an easy broth substitution is all I need to make it veg. Can't wait to try it! This looks yummy! I have always been scared of butternut squash. It seems too fancy for my skills. That looks amazing! I got the ingredients for your pork roast recipe at the store yesterday and hope to cook it this week. 🙂 I'll have to add this soup to my list, too! This looks amazing!!! I know hubby will love this 🙂 Thanks for sharing the recipe :)PS – I nominated you for a Liebster Award on my blog!!! This looks so delish!!! Got all the ingredients last night! 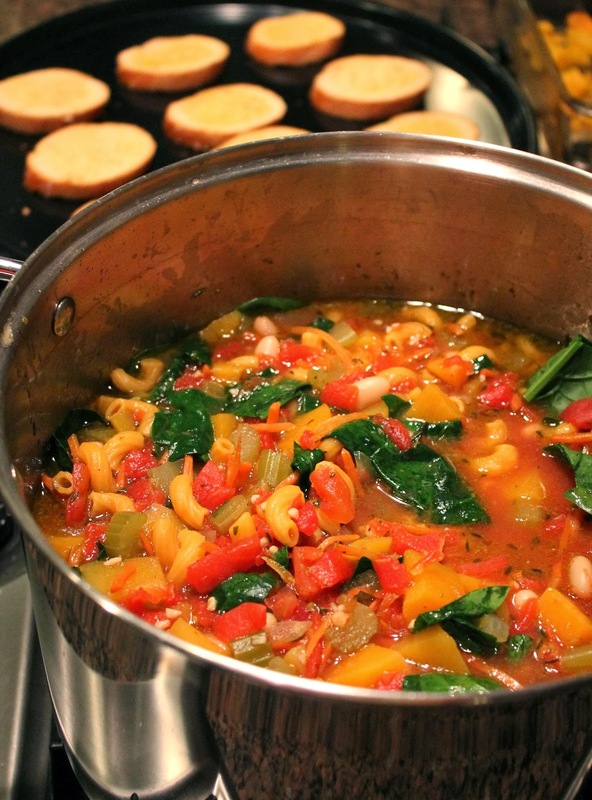 Nothing like homemade minestrone in the winter! Love it!